New Brunswick, N.J. - Rutgers Cancer Institute of New Jersey researchers have elucidated the mechanism behind an ‘on/off’ switch in the the most commonly mutated gene in human cancer – p53 – findings which senior investigator Darren R. Carpizo, MD, PhD, director of the Hepatobiliary/Liver Cancer Program and member of the Gastrointestinal Cancer Program, says could lead to a new paradigm in cancer therapeutics. The effort builds on the Carpizo Laboratory’s previous research in the development of a new class of anti-cancer drug known as zinc metallochaperones and their role in reactivating the tumor suppressor function of p53. 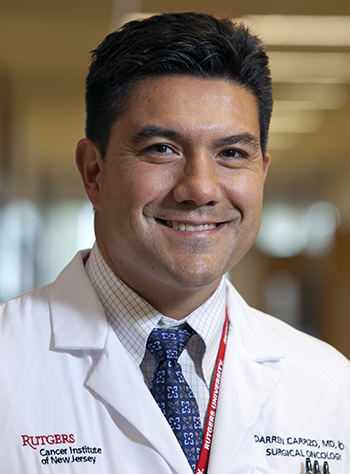 Dr. Carpizo, who is also an associate professor of surgery and pharmacology at Rutgers Robert Wood Johnson Medical School, describes the work which was published in the online first version of Clinical Cancer Research (doi: 10.1158/1078-0432.CCR-18-0822) on June 18. A: p53 is the most commonly mutated gene in cancer for which no effective targeted anti-cancer drug exists. The p53 protein is the most important protein in our cells that protects us from getting cancer. A number of cancers have to disable p53 by mutating its gene in order to progress into clinically detectable cancers. The majority of the mutations in the p53 gene are subtle changes to the protein that make it unable to function properly. For decades researchers have been searching for a drug that would correct the defect in these mutant proteins to restore normal p53 function. The p53 protein binds zinc (as many proteins do in the body) which is essential to maintain proper structure. A large percentage of mutations in p53 impair the protein’s ability to bind zinc resulting in abnormal structure. Our laboratory discovered a class of drugs that can restore the normal structure and function to these zinc-deficient mutant p53’s by restoring zinc binding. These drugs, called zinc metallochaperones (ZMCs) function by binding zinc in the bloodstream and trafficking it into the tumor. By raising the cellular zinc levels high enough, zinc will bind to mutant p53 and the mutant protein will become normal – but briefly. After several hours the protein will become mutant again. Q: What was the aim of the work? A: We wanted to understand why the activity of zinc metallochaperones only lasted several hours. Understanding this would be key to us determining how best to apply these drugs to humans. A: Since we knew (from our previous work) that ZMCs worked by raising intracellular zinc levels, we hypothesized that the reason the drug’s activity was so short was due to the cell’s natural response to an increase in zinc, which was to turn on cellular functions that normalize zinc levels. Zinc is a metal ion that is an essential element to almost 10,000 proteins in the human genome. Our cells come equipped with ‘machinery’ that keeps cell zinc levels very tightly controlled, otherwise the function of many proteins would be altered. We found that upon application of ZMC1 (a lead ZMC) zinc levels increased and then within hours came back down to normal. We performed several experiments to prove that the cell’s zinc normalizing machinery was the reason for this. We found that this machinery functions as a switch to turn ‘off’ the function of these drugs within hours of first exposure. This indicated that we only needed to expose the cells (and tumors) to these drugs for a short period of time for them to work properly. In fact our experiments show that as little as a 15 minute exposure was capable of doing the work that a three-day exposure would give in killing cancer cells. Q: How will this work help inform future treatment decisions? A: This is a remarkable finding because it means that when we use these drugs in patients we only need to expose them for a short period of time (minutes) for them to do what we want them to do. By having such a short exposure, the likelihood of toxicity will decrease. Historically, the aim of developing targeted anti-cancer drugs has been to increase exposure to these therapies in order to maximize efficacy. But as many clinicians know, maximizing drug exposure is not always ideal, as it often results in increased toxicity. Our findings will help guide future translation of ZMC use in humans. This research is funded in part by grants from the National Cancer Institute (R01-CA200800 and CA172676), the Breast Cancer Research Foundation and the Pancreatic Cancer Action Network. Other authors on this work include: Xin Yu, Rutgers Robert Wood Johnson Medical School and Rutgers Cancer Institute; Samuel Kogan, Rutgers Robert Wood Johnson Medical School, Rutgers Cancer Institute, Rutgers University; Yin Chen, Rutgers Cancer Institute; Ashley T. Tsang, Rutgers Robert Wood Johnson Medical School, Rutgers Cancer Institute and Mount Sinai St. Luke’s Roosevelt General Surgery Residency Program; Tracy Withers, Rutgers Robert Wood Johnson Medical School and Rutgers Cancer Institute; Hongxia Lin, Rutgers Cancer Institute; John Gilleran, Rutgers Ernest Mario School of Pharmacy; Brian Buckley, Rutgers Environmental and Occupational Health Sciences Institute; Dirk Moore, Rutgers Cancer Institute and Rutgers School of Public Health; Joseph Bertino and Chang Chan, both Rutgers Robert Wood Johnson Medical School and Rutgers Cancer Institute; S. David Kimball, Rutgers Ernest Mario School of Pharmacy, Rutgers University and Z53 Therapeutics, Inc.; and Stewart N. Loh, SUNY Upstate Medical University, New York.